The driving force in life that helps you take action and achieve your goals is an inspiration. Inspiration is the starting point that leads you to great success and innovation in life. Motivation and enthusiasm are other aspects which add inner strength and help you achieve what you inspire. Evolvement of inspiration is a creative process and can never be rushed, here are few ways for how to get inspired and develop new ideas. 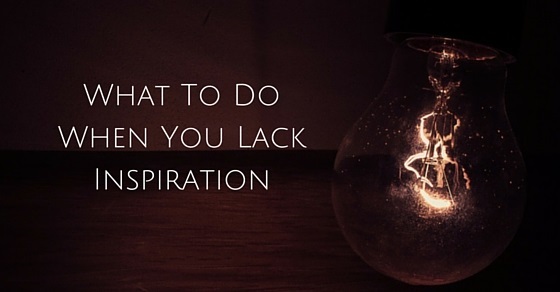 The following mentioned are few tips on how to get inspired when you feel lack inspiration. For ones who lack inspiration, it is mandatory to notice the way you feel the goal. Suppose you are about to publish a book, then make sure to forget the difficult hurdles in publishing the books. Think of the day you hold your published book, this will surely make you excited and thrilled. Your goal or dream is thus pictured and you’re boosted with confidence. When you aren’t able to move forward and accomplish your goals, then identifying the problem is vital. Analyze if you like the work, topic, find if you’re bored with the usual aspect and want to try something that’s risky and make you excited. For ones who lack inspiration regarding work environment, apart from sitting on the desk and working, you can get into fresh air for walk. You can find out that you do not suffer out of motivation but lack resources that keep you motivated. When there is creativity, there is force which would war against the creativity exercises. Steven pressmen who is an author for “the war of arts” mentions about this resistance that keeps you away from destiny. So open, when you need motivation to wake up every day expecting resistance and fight each day to do work. A person is emotionally as well as spiritually empty when found uninspired. In such cases the individual should remember to push themselves through the block. This is because the person is empty and requires to be filled up. Try to step away from work and do things that boost you and make you feel refreshed. The first cause can be due to resistance where the individual has his own laziness and is distracted more outside. They may also be forced in a negative manner to avoid doing this. The only opportunity here is to show up and continue with the work. The next factor is when an individual feels empty where he needs to be careful. This is merely wasting time in front of a computer or by just playing with a piano. In such cases the individual needs to step away and do things that fill them. They can go for a run, play with kids or listen to music too. But always remember that resistance is waiting to grab and get you back. And hence getting back to work is mandatory. A person is required to dive in and follow big dreams and required performance on a daily basis otherwise procrastination, laziness and absence of energy can be invited. For ones who feel uncomfortable and passive, motivation should be induced in them so that they feel happy and better in doing their things. Weakness, unhappiness and dissatisfaction is caused when laziness or procrastination is present and hence an individual should be enthusiastic and motivated where he can be focused and achieve success. Your inner strength can be boosted by doing certain unimportant or small things, by this way your inner strength is grown and you’re forced to do greater things though you aren’t motivated. This is one way which helps you to gain ability to focus on your requirement and energy you require. A few example things that can be followed to boost energy is by washing the dishing instantly rather than procrastinating, throwing away garbage instantly than postponing, taking a short walk by switching off TV, cleaning your cupboards, and reading your desired book though you may have work. Another way is to visualize and picture you like doing something in an energetic and enthusiastic manner. When you lack inspiration the first initial step is to find out the actual reason. The individual needs to work out and find out where the issue has raised from. For example if a person is physically or mentally exhausted, then he or she needs to take rest and deal with the changes in an emotional manner. Day dreaming is usually a mental break and is required to generate new ideas and thoughts or can come up with new inspirations. It is important to check with day dream and reality for some time. By this way you may look confused and dazed for a while but remember that by checking out with others and surrounding you can be a reason for inspiration and can be promoted, paid, or even look good. When your boss asks for a help and you’re unable to generate or offer him new ideas, you are unable to, as you lack inspiration. In such scenarios, stealing ideas from the net, by doing a quick online research from blogs, forums, magazines and more. By looking into the appropriate topic you may get inspired by and learn more. To help you get onboard a mood board can assist you get into mood often. There are people who think that they may be inspired at a later date and wait for the thought to toss on and expand. In such aspects a mood board like Pinterest, bulletin board and more can boost you and prevents lacking motivation to work hard. In whatever job you set out to do, success is something that can be done to motivate a person. For example you are trying to reduce weight and working out a lot, then motivation is boosted once good results are produced. When you’re dedicated in doing something, the positive results are something that helps energize your motivation. The individual should have a clear idea about what you want from what they are working. When you’re inspired in doing a certain task, make sure to focus on the same to be fulfilled and happy. By focusing on something that makes you happy and inspired, you can be motivated. A person may lack motivation when they aren’t near to what they want. When you move towards things that you want in life and reach success, then motivation is boosted and inspiration for life is built. Are you the one partying the whole night yesterday? Are you the one drinking the complete week? Or perhaps are you the one who did not sleep for eight hours since you had work? This evidently shows that you have been destroying your body. Your brain has the tendency to revolt when you completely destroy the body. In order to pop up with inspiring ideas that can assist you in work and personal life, such stuffs that destroy your body can be avoided. Plenty of sleep, good exercise and healthy food are required to keep your brain healthy and avoid lacking inspiration. In spite of all these hints and motivation tips there are people who still do not feel inspired. The only solution for such category of people is to give up and stop worrying. You may not have popped up with ideas for a week, so give up everything; sometimes giving up ideas can also make wonders and get you new ideas. It is a good idea to talk to people when you lack inspiration, instead of speaking about the present topic, discussing things that are off-tangent in the field is a good way where ideas are bounced off. By this way people who lack inspiration are inspired more. You might have spent the whole day on your desk, cubicle and must be exhausted, hence it is good to take a walk, restroom, or a sip of tea. It is also advised to get the blow of fresh air outside. All these are few magic that can help you evolve new ideas. For ones who lack inspiration remember to exercise daily so that you stay fit and get rid of all sweat in the body. Sweats assist you in staying fit and healthy. By this way endorphins are released and stress levels are alleviated. By this way you fit into the appropriate frame where you can think and work better. These are a few hints and tips that can be followed by people who are exhausted and lack inspiration. Inspiration in life is a spark that when ignited can form great wonders in life. Hence getting ideas and developing the mind about how to get inspired and succeed in a career as well as personal life.